Yesterday I took you through the first half of my day in the snow storm. Several inches of snow were falling on the ground, I found myself with a prolapsed cow who wanted me on the other side of the fence, and hours behind in getting things done around the ranch. I promised a more encouraging part of the story, and good news is I got more practice with my driving skills in the snow that day. After we got the cow sutured up and bedded down, it was time to finish checking the cowherd, which thankfully included finding an uneventful heifer calving inside a barn, and feeding more hay. The snow came down heavier than I have ever witnessed and was even so blinding at times I could not see the road in front of the tractor. Around 2 that afternoon, I finished feeding and headed to the house for a late dinner and some warm socks. After I got a bite to eat and thawed out, it was back to the pastures just to make sure everyone was still warm and well fed. 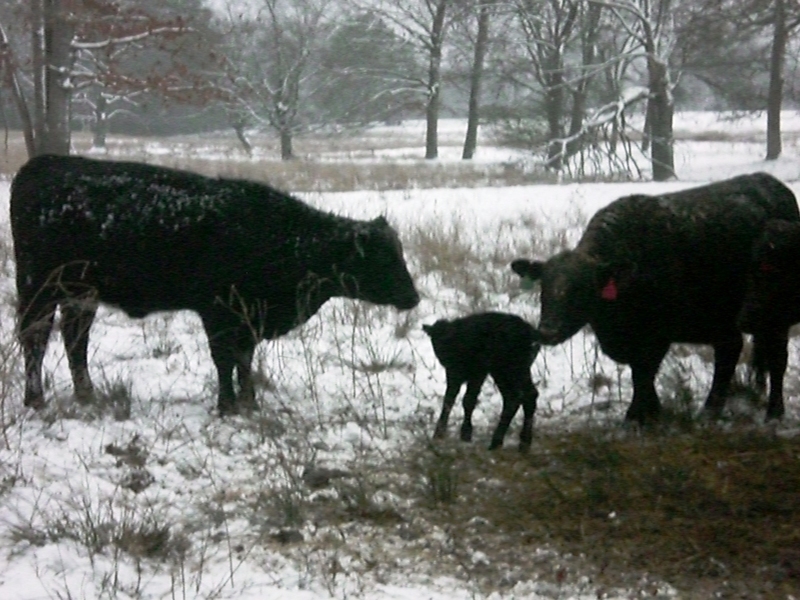 Low and behold, I found a heifer had calved during the day and the newborn was covered in ice and shivering. I knew I had to warm the calf, but was reluctant to take it from its mother because there is a delicate balance when encouraging heifers to nurture their calves when things go awry. I placed the calf in the floor board of my pickup so it could thaw and set the gates from the pasture to the hay barn across the road. I figured the best way to warm the calf and ensure the heifer would accept her calf was to leave them in the hay barn overnight where the pair would be out of the weather. This heifer was having no part of the corrals or the hay barn. I would eventually drive her to the corral gate and off she would go in the opposite direction. After a few tries, I gave in and took the calf to the house where I could dry her with towels and warm her up with colostrum. The longer I have the calf away from its mother, the less chance I have in the cow accepting the newborn, so I had to make a decision. Keep the calf inside and warm all night (ensuring its survival in this cold, wet weather) or taking a chance in the cold and returning the calf to the pasture before dark. Well, since I was dealing with a heifer, I knew it was important to return the calf as soon as possible. I returned the calf and things looked promising when the heifer came to the calf in the hay pile. 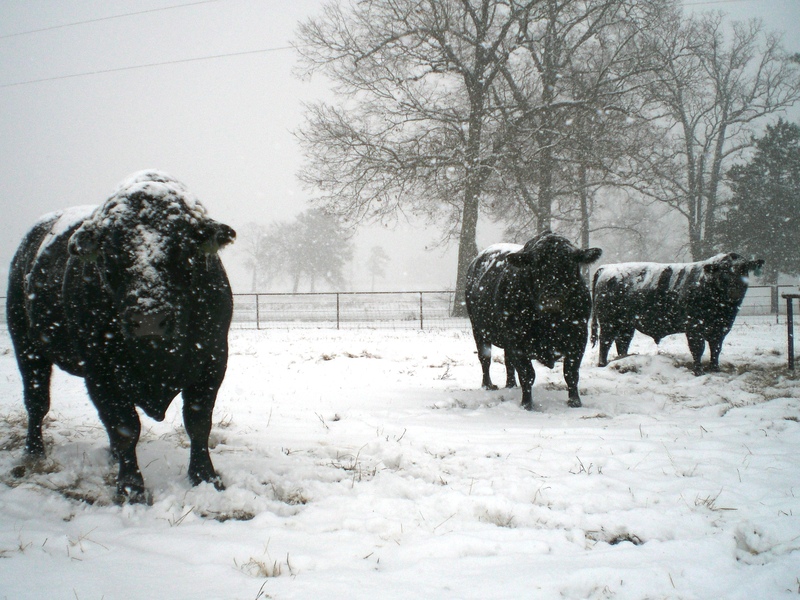 Next week I’ll continue this series about dealing with snow and winter weather on the ranch. I will show you how easy it is to give thanks and raise Agriculture Awareness and share a little more about calving season. Have any encouraging stories about caring for newborns in severe weather? Let me hear about them. I am the same way when dealing with calves. No matter what decision you make between leaving them with momma or helping them out it has a potential downside. Hope you have some better weather on the way soon. Calving heifers is stressful enough without weather issues.